As Christians, we often expect God to show up the way we thought He would or even He should. When He does not, at times we are forced to abandon our initial plans and hopes, and have to turn to Plan B. 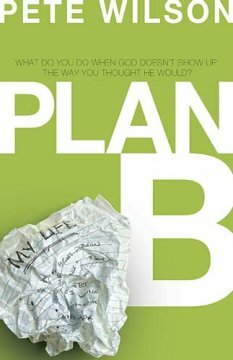 What is Plan B? Simply defined, Plan B is the alternative plan that we have to adopt when the dreams, wishes, goals, expectations in our initial plan, Plan A, are shattered. What do we do? This is precisely what Pete Wilson, lead pastor of Cross Point Church, expounded on. Pete started off by inviting the readers to face up a reality of life that we often wish we can escape: Plan B is not an exception, but rather it is an inevitable reality. Plan B does not just happen to some people. Plan B happens to everyone at some point of time. Yet, as Christians we often assume God wants us well, and our lives would be smooth sailing all throughout. We may not even admit it, but we are pretty sure God is going to sweep down and provide for us the way only He could. And that is when we get ourselves into all kinds of troubles as we assume God must think and act the way we do. Inevitably, dreams do get shattered; hopes dashed, and expectations failed. And when that happen, we often run away as an escape mechanism (Chapter 2). Not only do we run away, many of us do actually fall into some forms of addiction. Addiction has become the most common way for us to deal with our pain. Nevertheless, Plan B also often forces us to change our perspectives. Pete said that from his experience, often people in their dying moments, almost always talk about how they finally "get it." They understand that they've spent too much of their lives worrying about things that weren't worth worrying about, and fearing things that just weren't worth fearing (page 58). Worry saps our energy. As Earl Nightingale put it: only 8% of all our worries are real, legitimate worries. Ninety-two percent are pure fog with no substance at all. "The remarkable thing about fearing God is that when you fear God you fear nothing else. whereas if you do not fear God, you fear everything else." In essence, the greatest illusion is the illusion of control (Chapter 3). The fact that we have to abandon Plan A to adopt Plan B does not mean that our lives are spinning out of control, it simply means that we are often not in control of our circumstances! When people ask me how they can know God's will for their lives, I tell them the best first step is to know God. Beyond that, I really don't have any steps. Knowing God's will is not a science. There is no magical equation. Sometimes we get it all wrong. In fact, as Pete put it, it is often a matter of trial and error. At times we may encounter roadblocks as Paul did in Acts 16. Yet, Acts 16:6 says that Paul was"kept by the Holy Spirit from preaching the word in the province of Asia" (NIV). It was the Holy Spirit Himself who kept Paul away from preaching in the province of Asia. As Erwin McManus said, part of the problem is that we are asking the wrong questions. "The process of becoming the person God wants us to become usually doesn't come from success, success, success. It's loss, success, failure, success, heartbreak, success, disappointment, success." "Every day we have this choice to make - Am I going to define God by interpreting my circumstances or am I going to simply trust that God is who He says He is?" In fact, in many occasions, we are living in Plan B because we have usurped God's throne. Sin occurs when we, instead of gratefully accept life and other gifts of life as gifts, we demand them, we seize them as if they are owed to us. My lust, my pride, my anger, my lack of forgiveness - all that comes from a heart that believes I am entitled to something. Chapter 8 of the book deals with the subject of darkness. For many, we are often plunged into a depth of darkness when we have to live in Plan B. One of the results of darkness is doubt. We doubt about the goodness of God. Yet, Pete helped us to look at doubt in another way. The fact that we doubt is because we believe. Put it another way, if you have faith, you will always be susceptible to doubt. An unbeliever does not have to doubt; unbeliever does not even have the capacity to doubt, because he can't doubt something he does not believe in the very first place. Chapter 9 deals with the role of community support when we have to adopt Plan B. Quoting writer Anne Lamott, the most powerful sermon in the world consists of two words: me too. Knowing that there is someone out there who understands the pain we have gone through, and who himself or herself has gone through the similar process of pain, gives us hope and strength. And that's the gift of community. But often we pretend. We dare not face who we really are. But we can't benefit from the power of community until we dare face who we really are. "There is no greater disaster in spiritual life than to be immersed in unreality, for life is maintained and nourished in us by our vital relation with realities outside and above us." In other words, the irony is, Christian community can be a dangerous place when your dreams shatter because Christians can be guilty of cliched answers, untruthful promises, and false expectations. Therefore, Chapter 10 exposes some of the myths on Christianity. Being a Christian does not mean we have all the answers! (page 145). Chapter 10 also exposes us to the idols we often hold on to, and urges the reader to let go of these idols and to embrace the Cross. Chapter 11 is a continuation of Chapter 10 - the hope and power that we can have in the Cross of Christ. It urges the readers to hold on to the Cross - the Anchor during the storm of life. God has been with us all the while. And when I feel distant from Him, it is not because He has left, it is because we have drifted away. Chapter 12 is about waiting - something which many of us do not enjoy much of it. Yet, the Bible is full of accounts of people who had been on the waiting game (see Hebrews 11:13): Abraham and Sarah (Gen 11 - 21), Jacob (Gen 28-29), Joseph (Gen 30:20 - 41:39), John the Baptist (John 14:1-12), Noah (Gen 6-7), etc. Chapter 13 is about transformation through tragedy - more or less a summary of points covered in many previous chapters. Chapter 14, the final chapter, reminds us that ultimately in dealing with our Plan B, there is no such pre-packaged set of answers to all the Plan Bs. It is about a journey. A journey with God, to allow Him to change us and shape us into the person He wants us to be along the journey. In short, reading this book reminds me of Philip Yancey's Where is God When It Hurts and Disappointment With God. Many of the points covered here are covered in these two books as well. But Pete's writing is refreshing. It is written with a tone of compassion and warmth. Wow, excellent review! I really enjoyed your thoughts on "Plan B"!